One complaint I hear when talking to people familiar with Red River Gorge is that it is too crowded. You will certainly encounter quite a few people, especially on the popular hiking trails on a beautiful fall weekend, but you can escape the crowds if you are willing and able to be a little more adventurous. 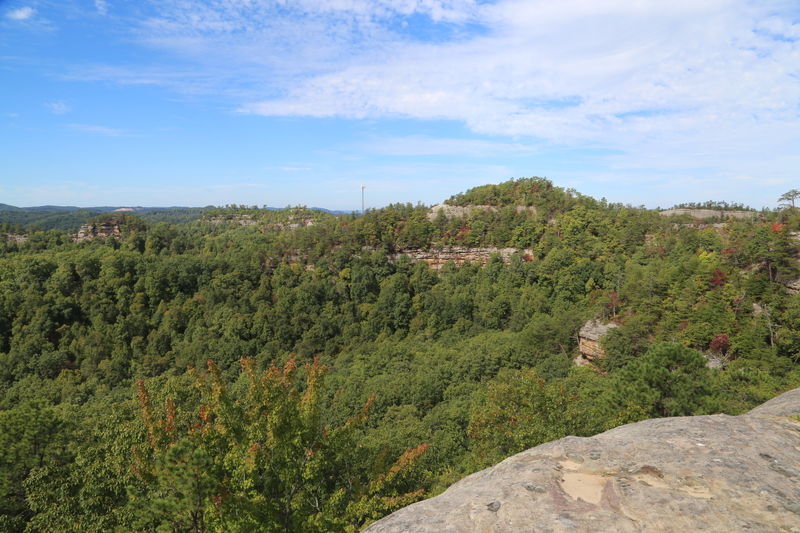 Before highlighting a couple of the trails we have explored I want to offer a few tips and notes of caution on hiking and backpacking off-trail in Red River Gorge. Know Your Limits: I don’t want to make it sound like these are high-risk, extreme hikes comparable to climbing Mt. Everest, but at the same time there are plenty of dangers that cannot be ignored. 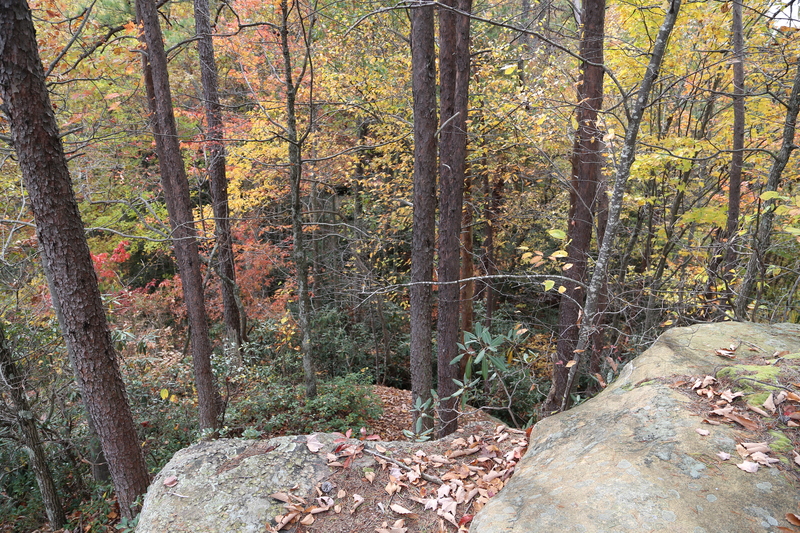 Even on the official trails in Red River Gorge there are many high cliffs and rocky paths where one could easily slip, fall, and sustain a serious injury, or worse! These risks are compounded when hiking on unofficial trails. If you are injured and unable to walk, you are further from help and it is less likely other hikers will just happen along to provide assistance. If you are an inexperienced hiker, I recommend sticking to the official trails until you have a few more miles under your belt and are confident with rough terrain and longer distances before venturing out on these unofficial trails! There are so many great places to explore and amazing things to see on the official trails in Red River Gorge that you really do not need to take the risk. Be Prepared: Even if you are only going out for the day, you still need to be prepared. Wear proper clothing and bring plenty of water (at least 2 liters per person for a day hike) and something to eat. You should also carry some form of emergency shelter (a 55 gallon trash bag will do), a whistle, a headlamp or small flashlight, a way to start fires, a knife, a first-aid kit, and, last but not least, a good topographic map and a compass (even if you carry a GPS unit). Handheld GPS units are nice, but batteries die (carry extras), LCD screens can get cracked (personal experience), and reception can be poor or non-existent especially in deep valleys with heavy tree cover. Take time to learn how to use a map and compass. This is an important skill to master if you have a desire to go deeper into the wilderness. A book I have owned since childhood, and one of the best on the subject, is “Be Expert with Map & Compass” by Bjorn Kjellstrom and Carina Kjellstrom Elgin. Finding Your Way: Difficulty navigating is a concern. Even though many of the unofficial trails are well traveled, especially in the first half-mile or so, there are no signs, trail blazes, or navigational aids of any sort. As you get further off-the-beaten-path, these trails can be quite overgrown and difficult to follow. There are also many side trails that can cause confusion finding your route. A good map is essential. The USGS 7.5 minute topographic maps are helpful for understanding the terrain, but generally do not show even the official trails. The outrageGIS maps are the best I have found for actually exploring the area, showing even the smallest unofficial side trails, the best views, and all the established campsites. Goodpaster’s book is a great companion to these maps, providing detailed descriptions of the unofficial trails with GPS coordinates, elevation charts, trail ratings, and more. 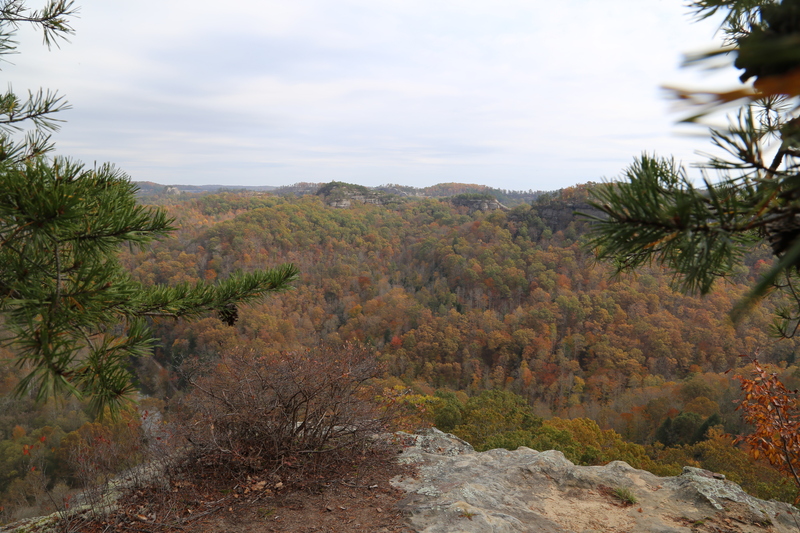 With some experience in wilderness navigation and these two resources, you should have no problem finding your way around the backcountry trails of Red River Gorge. 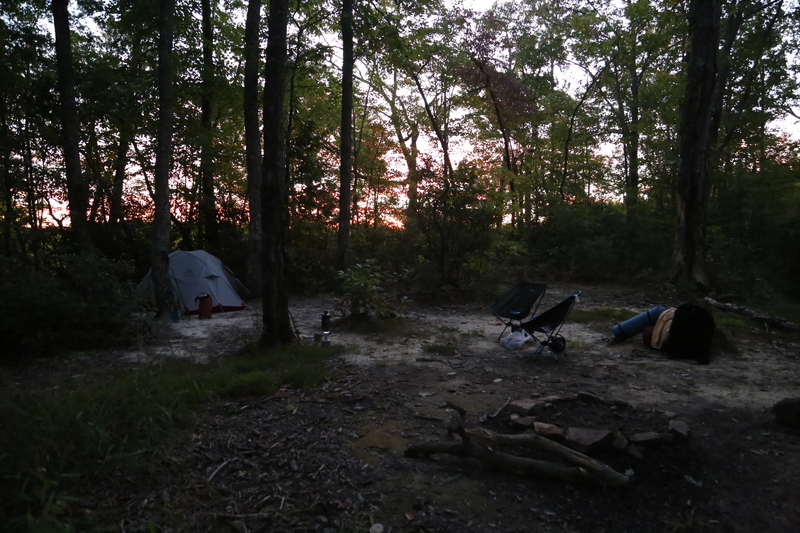 Where to Camp: There are no official backcountry campsites in Red River Gorge, but there are quite a few well established campsites along the unofficial trails that you will find marked on the outrageGIS maps. These sites are easily accessible, generally clear of underbrush and vegetation, and most already have rock campfire rings. So, while there are no rules that prohibit creating new campsites (within the restrictions shown below), there is really no reason to go the DIY route. Using an existing campsite minimizes impact on the area and is less work. – in any picnic area or parking area. – within 300 feet of any road or developed trail. – within 100 feet of the base of any cliff, or the back of any rockshelter. – within 600 feet of Gray’s Arch. Availability of Water: The key point to emphasize on this topic is that there are no water sources at the trailheads. Also, many trails run along the top of ridgelines where there is no easy access to natural water sources. Even if you plan to camp in a valley where a creek is shown on the map, keep in mind that some of the smaller creeks are seasonal and do stop flowing during drier times of the year. If you are planning to treat your own water you may want to consider the possibility that the distance to the nearest natural source may be further than just packing in the water you need and hiking back to your vehicle at some point to resupply. You should always have a way to treat water in an emergency, just realize that sometimes it may not be the best option for your primary water supply. Be Considerate of Others: Whether day hiking or camping, but especially when you are backcountry camping, remember that most people are there to enjoy the peace and serenity of the outdoors. Nobody wants to hear your obnoxious, drunken hollering at 1 AM in the morning, so just zip it! Besides, high cliffs and a high BAC generally are not a good mix. Also, if you pack it in, you need to pack it out. Clean up your own trash and pick up anything you might find that has been left behind by others. As for campfires, make sure there are no bans in effect, collect only as much downed wood as you need, and most importantly, make sure your fire is completely out before you depart. Finally, though many have already carved their marks on the rocks and trees of the gorge, there is no reason to add your signature to the page. On two beautiful weekends in the fall of 2014 we took advantage of nice weather to hike a couple of unofficial trails we had not previously explored and enjoy some backcountry camping. The first trip was September 26th and 27th, just as the fall colors were staring to appear. And the second was October 24th and 25th which was likely the peak weekend for that year’s fall colors. The trails we hiked both weekends are off of the Double Arch Trail (#201). The first 1.4 miles of this trail were originally a part of Tunnel Ridge Road that has been closed to vehicular traffic for several years. Some older maps I have seen show this as an active part of Tunnel Ridge Road. However, regardless of what your map might show, this is now a hiking trail and you need to park at the Auxier Ridge trailhead. As these are unofficial, unnamed trails, I will refer to them by the names Goodpaster uses in his “Hinterlands” book. On our first trip we hiked the Star Gap Arch Trail (pg. 218), and on the second trip we hiked the Jailhouse Rock Trail (pg. 163). We camped in different spots on each trip, but both campsites were located near the beginning of the Star Gap Arch Trail. Here is a rough map of these two trails I have drawn in Google Maps which also highlights a few key landmarks. I do not suggest using this map for navigation purposes, but it should give you a good overview of the area. I will forgo detailed descriptions of these hikes and share the beauty of the two trails through photographs and brief captions. As the old saying goes, “a picture is worth a thousand words.” So here are several thousand, unwritten words for you to enjoy. Campsite at sunrise from our Star Gap Arch trip. View looking north from the Star Gap Arch Trail. View looking west from one of the Star Gap Arch side trails. The final climb on the Star Gap Arch Trail. The views are worth it! 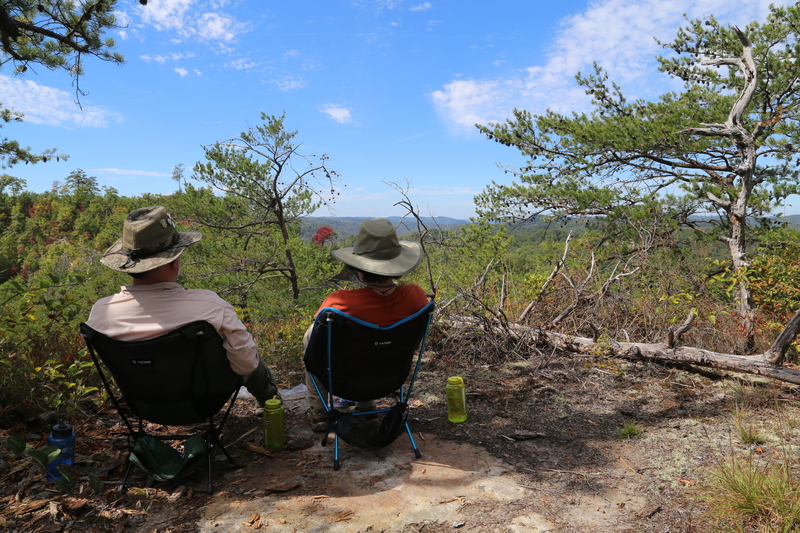 At the end of the Star Gap Arch Trail enjoying lunch and the view in comfort with our Helinox backpacking chairs from Big Anges. First trip with our new Teton Sports backpacks. When backcountry camping in the gorge you always have a dinner table with a view! Here are a few billion reasons to go backcountry camping! View of Star Gap Arch from the Jailhouse Rock Trail. Looking west on the Jailhouse Rock Trail. 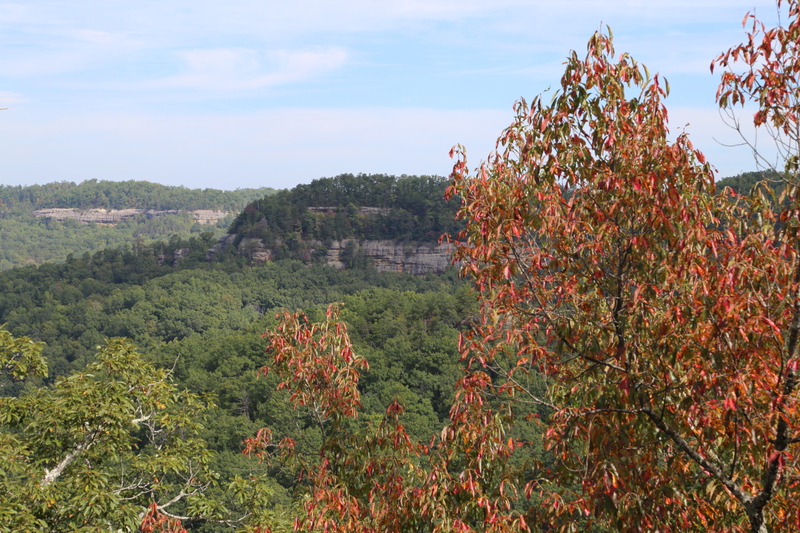 The view from Jailhouse Rock includes Courthouse Rock, Double Arch, Auxier Ridge, and the Red River. There is a trail here somewhere. Both of our trips were on fall weekends with near perfect weather; and, although we were hiking from one of the busiest trailheads in the gorge, we still found plenty of solitude. The second weekend was one of the most crowded we have experienced in terms of the number of cars and people at the trailhead! 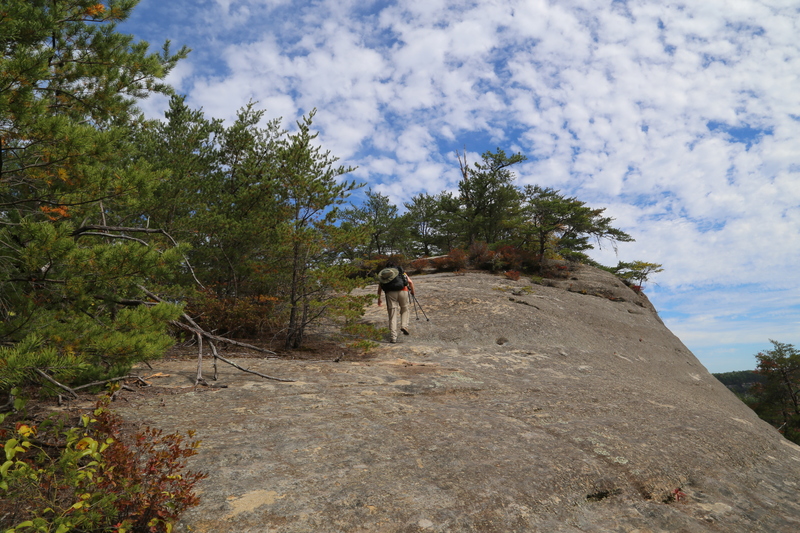 Yet, after hiking past a camp site about 1/4 mile down the Jailhouse Rock Trail, we only had brief encounters with six other hikers, a group of three, a couple, and a solo hiker. After leaving the official trail behind, we were basically alone in the wilderness, proving that it really is possible to get away from the crowds in Red River Gorge, even on the busiest fall weekends. © Todd D. Nystrom and Todd the Hiker, 2014-2017. Last year we did a 3 day, two night backpacking trip through Rough Trail. It was awesome but looking for more views, 7-9 miles/day. We were lucky we only saw a hand few of ppl last trip mid November so we would like to stay away from high traffic tails. What would you suggest? There is no route that perfectly fulfills all your requirements unless you pull out the maps and carefully plan a route combining several official and unofficial trails, and possibly some stretches along the road. Even then you will likely have to make some compromises. So, I will suggest something that best meets your first criteria of more views. Hands down the best route on the official trails for views is the Auxier Ridge, Auxier Branch, and Double Arch trails. And, while that combination only gives you about 6.5 miles on the official trails, if you incorporate both unofficial trails (Star Gap Arch and Courthouse Rock) mentioned here you will add another 8-9 miles. These two unofficial trails abound with spectacular views, as well, and also provide several excellent campsites. As for avoiding high traffic areas, the Auxier Ridge trailhead tends to be pretty busy for the very reason that it is where the best views are found. That said, by mid-November the crowds will be slowing down and most traffic will be limited to day hikers on Saturday, who will generally be encountered on the official trails and concentrated in the areas closest to the trailhead. If you venture out on the two unofficial trails you should find yourself pretty isolated. While the distance and isolation on this route do not perfectly fit your criteria, this is the place I almost always take first timers to the gorge because the quantity and quality of great views far exceeds any other route. I hope this is helpful and that you have a great trip! I’m originally from Lexington, living in Atlanta, and I’m considering a 3 day solo camp at the end of winter early next year before certain wildlife becomes active. I appreciate your insight into off trail hiking and camping. Thanks for the info! Your are welcome! That is a good time of year as it won’t be busy, the insects won’t be out yet, and the temperatures will still be very comfortable. I’ll reiterate the usefulness of the OutrageGIS maps in planning your route, especially when it comes to finding the best off-trail views and campsites. Let me know if you have questions on particular trails or areas and I’ll do my best to answer them. Thank you so much for all of your thorough writing and responding to questions on here! I’m coming down from Ohio for a 3-day 2-night trip November 16th-18th. I have done strenuous day hikes (18 miles on rough terrain) in the past and have rudimentary land-nav skills. I have a decent plan coming together (thanks in no small part to all of your writing), but am wondering what you consider to be “busy”. I don’t mind having some “friends on the trail” but am certainly hoping to avoid Main St in the forrest. Are you able to quantify the November traffic at all? You are quite welcome, and I am happy to hear that the info on my website has proven helpful! The crowds are usually waning by mid-November, anyway. The peak fall colors will be faded, and even if it turns out to be an exceptionally nice weekend, the bulk of the traffic will be dayhikers most of whom will arrive later on Saturday morning and stick to the areas around major trailheads like Auxier Ridge or Double Arch. The casual backpackers will generally be deterred by cooler overnight temperatures, as well. Stay safe and enjoy your time in the gorge! I just saw the notice quoted below from the U. S. Forest Service regarding the condition of Chimney Top Road. This may not affect your plan, but thought I’d pass it along to you just in case. It sure does, taking the 4×4 Suburban instead of the sedan. Thank you! You are welcome! Happy to be of assistance! My son is planning to propose to his girlfriend next week at RRG. What are the most breathtaking spots and best picture opportunities? Should he consider Natural Bridge as well? We’ve only been to RRG once for an overnight. 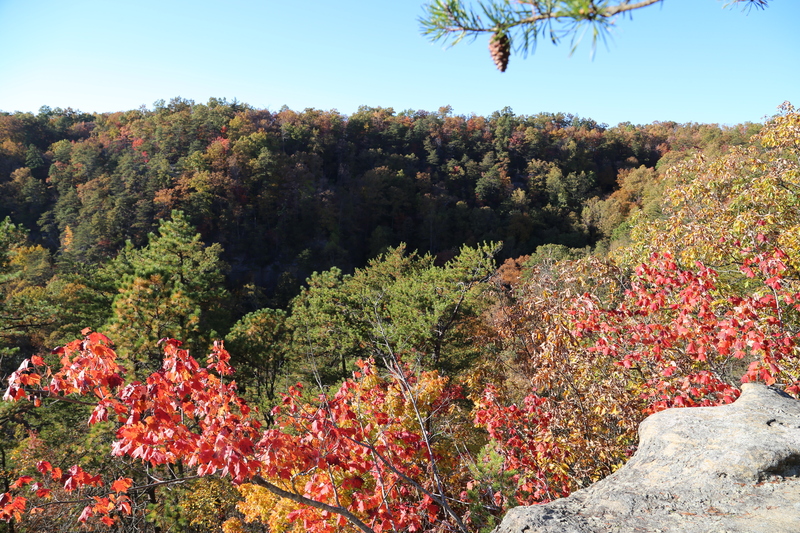 If hiking to get to the spot is OK, I would definitely recommend the Auxier Ridge trail out towards the end overlooking Courthouse Rock (2 miles one-way). The views on Auxier Ridge are spectacular; it is the trail I usually take others on to introduce them to the gorge. The views in Natural Bridge are definitely beautiful, as well, and worth considering, but Natural Bridge will likely be quite a bit more crowded and it may be difficult to get pictures without other people in the shot. Congrats to your son and his girlfriend in advance! Hi, Todd. Great page! I bought the map and compass book you recommended but I’m having difficulty deciding what scale compass I should get. Most of the compasses with good reviews are scaled at 1:24,000, but the Red River Gorge map from ouragegis.com says their map is scaled to 1:15,840. I can’t find a compass at that scale, plus I’d like to use it for other maps in the future. Do you think the 1:24,000 scale compass will work for me? I suppose I could be patient until the book arrives, but I’m excited! Lol! Thanks for any input! Thank you! You definitely want to get the 1:24,000, that is a standard scale and also the scale of the “gold standard” of topo maps, the USGS 7.5 minute quadrangle maps. The OutragGIS maps are an unusual scale, but the best maps for explaining RRG. Hey Todd. Do you by chance have any location data (gps or good description) for the unofficial trailhead for Coppera’s Falls? From what I’ve read it’s basically along the river with several crossings, but I want to make sure we start in the right place. My buddy and I are doing a 3 day 2 night trip this weekend and wanted to hit a couple off trail sites. Going to stop at Cloudsplitter for sure! Thanks! I also love the scriptures! Here are coordinates for the starting point of the trail to Copperas Falls: N37° 49.259′ W83° 34.536′. The trail is less than 100 yards west of the Osborne Bend trailhead parking area and across from the Copperas Creek Canoe Launch. The trail starts on the east side of Copperas creek, and is well established It follows the creek the whole way, crossing the creek (I think) 15 times (if our count was correct the last time we hiked that trail). The falls is about 1.5 miles in and with all the rain we’ve had should be quite spectacular. You are correct, the trail to Copperas Falls basically follows Copperas Creek the entire way. The trail starts off on the east side (to the right of the creek when facing the trail from the road) and very quickly rises up above the creek for a little ways before descending back to creek level. The trail crosses the creek numerous times (I think we counted 15 creek crossings) on the route so be prepared to get your feet wet. In drier weather, when we last hiked the trail, the creek crossings were pretty easy and we didn’t get a bit wet. That said, some of those crossings may be a bit more challenging right now, especially with all the rain they have had down there recently. Stay safe and enjoy your time in the gorge!! I am planning a trip with my son for his graduation from college! We will arrive June 1 around 5 PM and leave Sunday June 3 around 2PM. We plan on backpacking. Usually hike 8 to 10 miles a day depending on teraine. What do you recommend? Will we be able to get water or do we need to pack it in? We will be new to RRG and are in average shape. We have moderate hiking experience. All suggestions are appreciated. Thank you for your very intuitive site and I love that you use scripture! Thank you, Claudia. For both routes I will recommend, I will start by suggesting you get the OutrageGIS maps I mention on this page because there are a couple of great unofficial trails (shown only on these maps) that are a must to explore. The maps also indicate where you will find the best views on both the official and unofficial trails, and most importantly show where to find the good, established camp sites. That said, my first recommendation is the loop formed by the Gray’s Arch (#202), Rough (#221), Koomer Ridge (#220), Buck (#226), and Pinch-em Tight (#223) trails. Overall this loop is about 11 miles of official trail, but when you add in a couple of the unofficial trails that branch off of this route it will be closer to 16 miles. The second recommendation is the loop formed by the Auxier Ridge (#204), Auxier Branch (#203), and Double Arch (#201) trails along with the two unofficial trails I mention on this page. Including the out-and-back on the two unofficial trails this route is about 14.5 miles. There are some spectacular views on this route, as well as campsites with incredible views on both of the unofficial trails. The downside of this route is that it is likely to be more crowded because of these spectacular views. As far as water is concerned, there is no water at the trailheads so I suggest bringing water to start out with. The first route has several creek crossings where you will be able to resupply on water (filtering/purification required); while the second route has only one creek along the Auxier Branch trail, in the valley between Auxier Ridge and Double Arch. In either case, it is important to note that most of your better campsites will be up on top of ridges, so be aware of this and make sure you take advantage of this and resupply when the trails take you along/across these creeks as the hike from a ridge top campsite into the valley and back can be pretty substantial. Let me know if you have any other questions. Congratulations to your son and enjoy the amazing beauty of God’s great creation down in the gorge!! My son and I are planning our annual backpack trip. 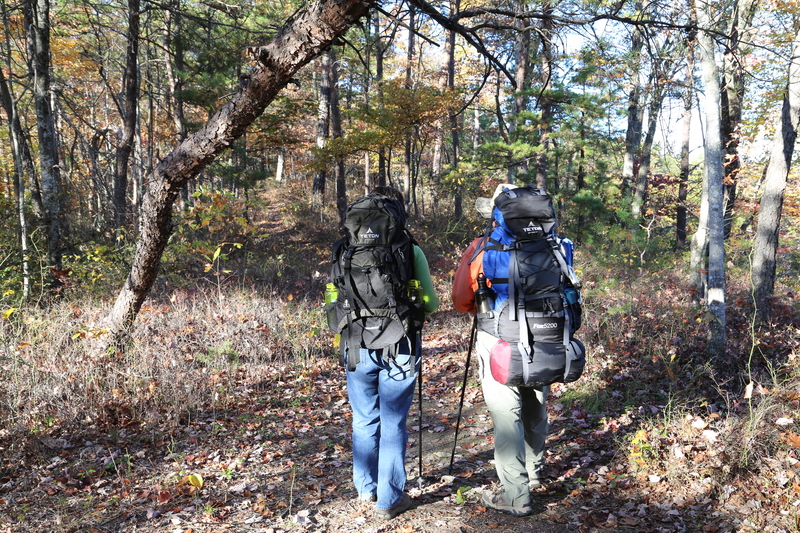 We would like to do a 4-day, 3-night hike in RRG, starting Sunday, 3/25/18. We are both at least moderately experienced backpackers, and would be looking for 35-45 miles over the 4 days. Would you have some recommendations? There aren’t any continuous, simple to describe routes of that length in RRG but there are certainly enough interconnecting trails to stitch together a trip of that distance. To accomplish this, though, some hiking along the roads will be required, and possibly a bit of doubling back at some point depending on whether or not you want to start and end at the same location, or if you are able to stage a vehicle in order to start and end your hike in a different place. In planning a trip like this, the maps from outrageGIS (https://www.outragegis.com/gorge/) are the only source I am aware of that show all the unofficial, but well established campsites in RRG with enough detail to map out a route and identify places to camp each night. One of the challenging things in RRG is finding a level and accessible spot to camp that is far enough off the official trails to meet the requirements. There are quite a few places to camp, but there are also areas where you can hike for quite a while without a decent spot, so having the outrageGIS maps will allow you to pick spots ahead of time or even improvise on the trail if you decide you want to shorten or lengthen your hike on any given day. The maps also help identify where the campsites are in relation to the creeks and streams which are going to be your only source of water, as many of the best campsites with great views are up on the ridges and can be a mile or more from the nearest water source. 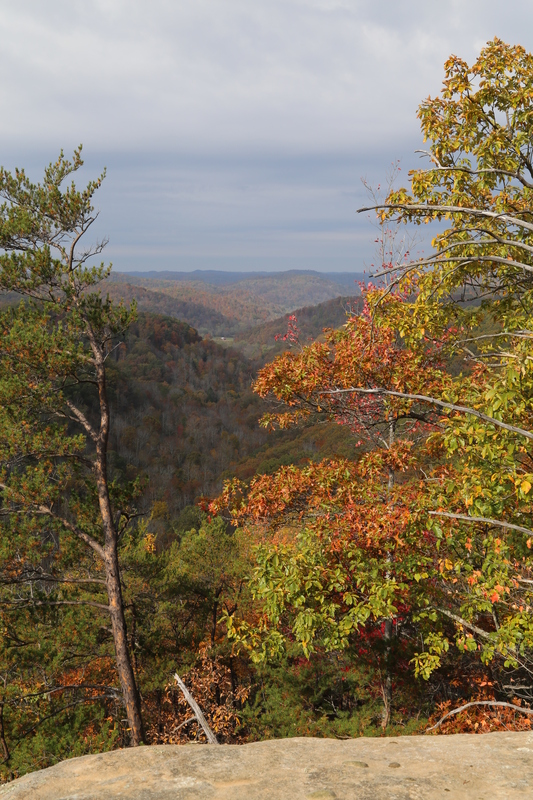 As far as the scenery, there are so many great places you can’t go wrong anywhere in RRG, and the maps have marked out where some of the best views are, as well. I know we have found some amazing views we otherwise would not have without the maps. Another thing to consider, especially in the spring, is that the gravel roads (Tunnel Ridge Road, Chimney Top Road, Rock Bridge Road) often get closed to avoid damage and rutting if there has been a lot of rain, so you will either want to plan on parking at a trailhead along a paved road (Rt 77 or Rt 715) or at least have an alternative trailhead in mind just in case. Hopefully this helps and have a great trip! Thanks for putting so much time and information into your site. Going to be visiting the RRG for the first time in 2 weeks for a 2 day (1 night) backpacking trip with my wife. We backpack regularly and looking for a loop in the vicinity of 8-10 miles, wanting to see as many points of interest as possible along the way including a nice overlook of the river itself. Do you have any suggestions? There really are not any pure loop hikes that have a good overlook of the river itself. The official Auxier Ridge Trail and Double Arch Trail do form a loop (~6.5 miles if you include the spur trail out to Double Arch). 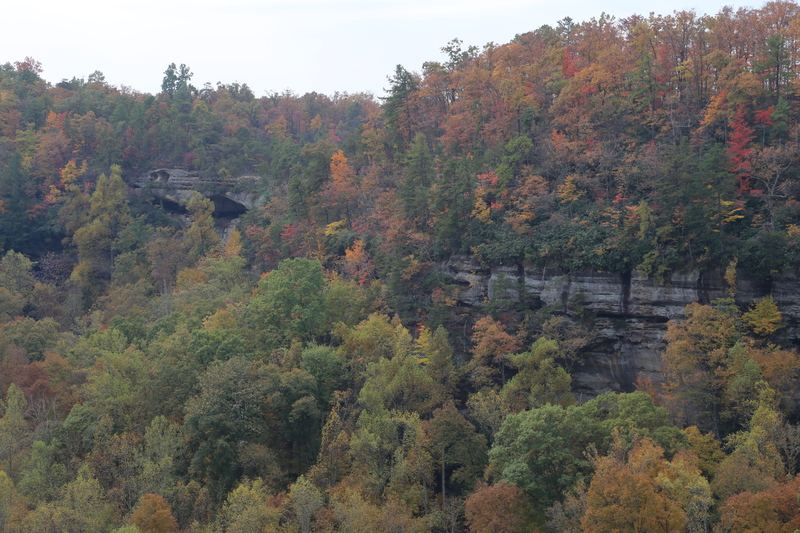 These are both iconic points of interest in RRG with many spectacular views along the way. The best river overlooks in this vicinity, though, are on the unofficial Jailhouse Rock trail. Hiking both of these official trails (Auxier Ridge and Double Arch) along with the full out and back on unofficial Jailhouse Rock trail would be my top recommendation. It would be around 10.5 miles total and it really encompasses some of the most spectacular scenery of the area and gives you somewhat of a loop to hike. Another option I will mention that is fully a loop, but without views of the river, is to combine the Gray’s Arch, Rough, Koomer Ridge, Buck, and Pinch-em-Tight trails which makes about a 10.5 mile loop. This is a definitely a more rugged hike that crosses several ridge lines and involves a number of ascents and descents along the route and there are not as many of the spectacular vistas as you will find on the other option I am suggesting, though this loop will likely be less busy than the Auxier Ridge and Double Arch trails. Hopefully this helps, and enjoy your time in the gorge, it is an awesome place! Thanks for the help Todd. We will give one of these a go! Looking forward to it! Just wanted to follow up on our trip. We ended up parking at the Rough Trailhead lot and doing the Rough, Gray’s Arch, Pinch-Em-Tight, Buck, Rough Trail Loop. Camped off an unofficial trail just north of the Rough/Rush Ridge Trail which offered spectacular views overlooking the gorge and captured a meteor shower that night. The hike was rugged at times, especially the last mile back to the Rough Trailhead, but we enjoyed the challenge! We logged around 11 miles total. We finished off the trip driving to Chimney Rock and Princess Arch. Thanks for the insight. We loved the gorge. Planning on heading back in 3-4 weeks to do the Auxier Ridge/Double Arch loop! Thanks for the follow up! I enjoy hearing how my recommendations match up with people experiences. I suspect I know the spot you camped and if it is the spot I am thinking of you picked one of my favorite camping spots. 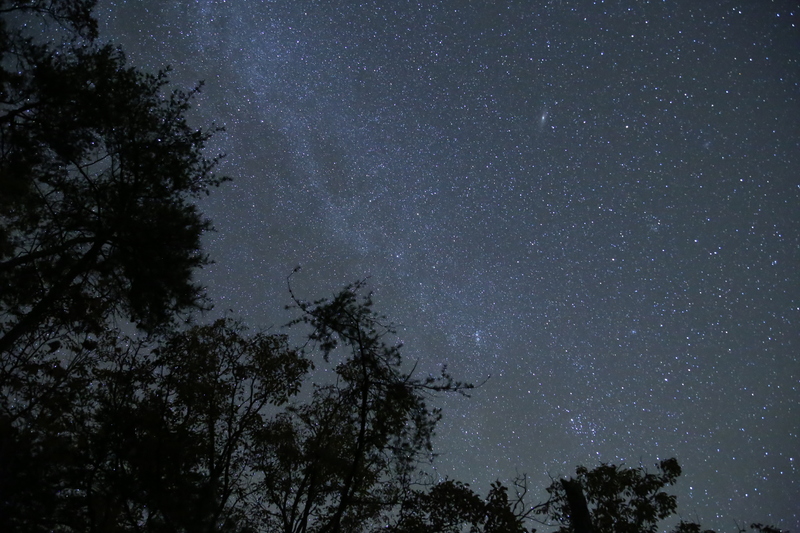 In fact, I’ve done some star photography from that spot, myself…and as you said, spectacular views! Hi Todd! We love your site and were thinking about doing one of these hikes/camps on the July 4th weekend of this year. Do you have any thoughts regarding areas to explore that won’t be too crowded? Thanks. Summer holiday weekend crowds are difficult to predict, fall weekends are guaranteed to be very busy, but summer will likely depend a lot on the weather. I expect the official campgrounds, like Koomer Ridge, will fill up quickly; however, the unofficial, backcountry sites like these may or may not be filled. I have backpacked on a July 4th weekend before and got exactly the spot I wanted. I still recommend you get there as early in the day as possible, and if you can get there early on Friday vs. Saturday that is even better. The later you arrive the more limited your options will be and the further you will have to hike in to find a good campsite. That said, the further from the official trails you hike the fewer people you will see. My other recommendation is to make sure you have good maps to help you locate alternative sites if those you hope to use are already occupied. Hopefully this advice will serve you well. Let me know if you have any other questions. Hi! Love your site. Have used it multiple times for some great descriptive hikes. I am heading there in October with a friend who has never been camping. I’d love to give her a positive experience since normally we rent a cabin, which is lovely but expensive! And I love backcountry camping more than anything. With that said, id love to have some recs for back country campsites that aren’t on unmarked trails. Something relatively close to our car (1 mile or so) where we can still access it for water and supplies. With this being her first time camping, I’d like to make it a memorable one! Staying on a campground is out of the question unless you have special spots other than Koomer ridge. Would rather have a primitive spot though. Thank you for your wonderful webpage! It’s been a great reference for one of my favorite places in the whole world! Even though you don’t want to go on an unmarked trail, I highly recommend the unofficial Star Gap Arch trail I mention on this page. Even though it is an unofficial trail it is as good as many of the official trails and is also an easy hike. The two campsites I mention here (also shown on the map) are just over a mile from the Auxier Ridge trailhead, so your distance criteria would be met. Also, there are other good sites that are easy to find if both of these are occupied. 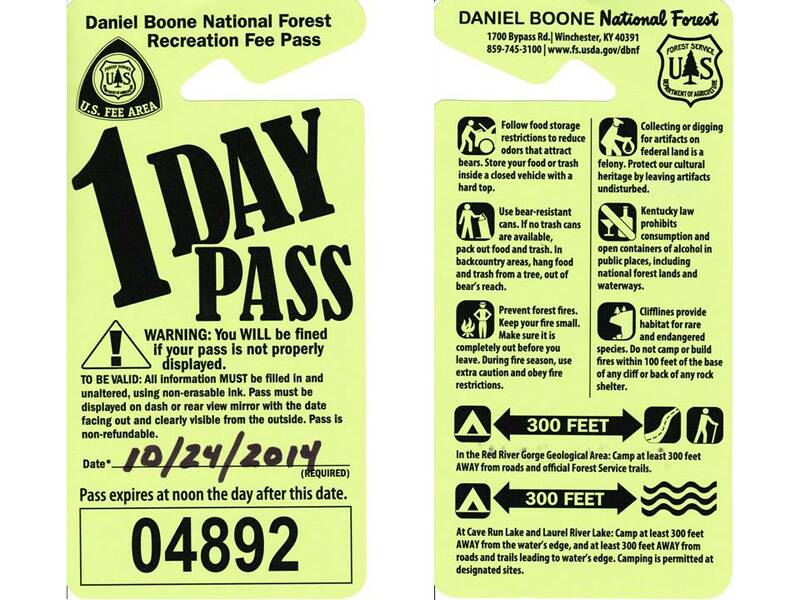 Any sites closer to a trailhead, whether in the Auxier Ridge area or anywhere else in the Gorge for that matter, are generally going to be overrun by the party crowd and won’t provide a good taste of the backcountry. Another advantage of this trail is that it provides easy access to the official Auxier Ridge and Double Arch trails if you plan to do any day hiking, and, you always have the option to explore further out on the Star Gap Arch trail or check out the Jailhouse Rock trail if you are feeling adventurous. If you are planning to go on a weekend in October, I recommend trying to get there as early as possible on Friday to ensure you are able to get a decent spot to camp; this applies anywhere in the Gorge on a fall weekend, not just this particular area. Let me know if have any other questions, and most of all enjoy! Hey Todd, Thanks for taking the time to share these for everyone to see. My boyfriend and I go camping often but this will be our first backcountry camping adventure. After reading this I would like to do the unofficial star gar arch trail. Do you have any recommendations on how to pack light? We planned to bring things to make over a fire like hotdogs and such but not sure how we’d bring a cooler and other things we might need that are a little heavier. If you bring anything that requires a cooler, like hot dogs, you can freeze them first so you don’t need ice or cold packs. We have done this a couple times with steaks, but it only works for the first night out, as they won’t stay frozen for very long, unless it is cold outside. I suggest limiting cold items to whatever you can fit in a small soft sided cooler that can be stuffed into, or strapped to the outside of, a backpack. To save weight when it comes to meals you may also want to consider pre-packaged meals. You do not necessarily need to buy expensive dehydrated backpacking meals, though. If you go to the grocery store you can likely find quite a few options in the soup or packaged dinner aisle. Many of these will require cooking, or at least boiling water, which means you’d need a backpacking stove and fuel as well as some type of pot. I use an MSR Pocket Rocket ($40 plus 8 oz. of fuel for $6) and an MSR Stowaway Pot ($25). If you don’t want to take the plunge to buy a backpacking stove, fuel and a cookware you’ll can go shopping for pre-packaged foods that don’t require cooking. Tuna in single serving foil pouches or peanut butter wrapped in tortillas are typical lunches for us. If these options don’t appeal to you, you can browse the aisles at the grocery store and find things that do. The main things to avoid are cans, and large packages that you cannot eat in a single sitting. Also, you can consider re-packaging things into serving size zip lock bags. Depending on how many nights you are planning to be out water is going to be one of your heaviest items, I’d suggest at least 3 liters per person per night for drinking, cooking, and clean-up. There are not any water sources on the ridgeline by Star Gap Arch, nor is there water at the trailhead; so, you will need to bring all the water you need. If you are going to be out for multiple nights you may want to keep the extra water in your car and hike back to the trailhead to resupply each day rather than trying to carry it all to the campsite at one time. Hopefully these tips help you. The key things to look for in backpacking meals are lightweight and compact items that won’t spoil and won’t get crushed when you cram them into a backpack. You’re welcome. God bless and enjoy Red River Gorge! My family and I spent 3 nights backpacking in the gorge in April. It was awesome and your site was very helpful in preparing. The only disappointing part of the trip was that so many of the established campsites were roped off. I understand why they do this, but it made it hard at times to find a good site. We are thinking about heading back this fall. Do you know if they’ve opened up these sites? Any other advice on campsites in RRG? We just got home from the gorge after a quick day hike, and saw several roped off areas along the official trails. From my experience, the sites that are roped off are ones that don’t comply with the “greater than 300′ from established trails” rule. In order to find good campsites, you will need to venture out onto the unofficial trails. We have always used the OutrageGIS map set which is great for finding these unofficial trails, as well as the campsites located along them. That map set has also helped us find many amazing views that are not shown on any of the official maps. I hope this helps and that you’re fall trip there isn’t as frustrating. Thanks, Todd. That makes good sense. I’ve got the OutrageGIS maps and will try some of the unofficials. Really enjoy the site! Thanks for everything you have shared Todd! My wife and I are making our first trip to the Gorge this Labor Day weekend (September 5th-7th) and have used much of what you have shared as a guide in planning! As our first backpacking trip, I was hoping for your feedback: Is this time of year very busy for dispersed camping? If so, we are considering the Sky Gap Trail for a campsite, would you support this decision for our first trip? Also, we are only here in the mid-west for summer and are moving back to the west coast in the fall, making this quite possibly our only trip to the Gorge. With only one trip, what trails for a once an only trip would you recommend as a must for experiencing as much of the Gorge as possible? We just became friends on Facebook so if that is easier please message me there! Thank you! Jeff, I’ll pass along a couple of quick thoughts here and we can talk more details via Facebook, as well. As far as crowds on Labor Day weekend I can’t say for sure, but suspect it shouldn’t be too bad. Fall color time seems to be the most crowded time, and even then we have not had trouble finding a good spot. I have also been down there over the July 4th holiday weekend once and had no problems. One recommendation is to get there as early as you can on Friday as an added measure of insurance for finding a spot, plus you can relax and enjoy the evening! 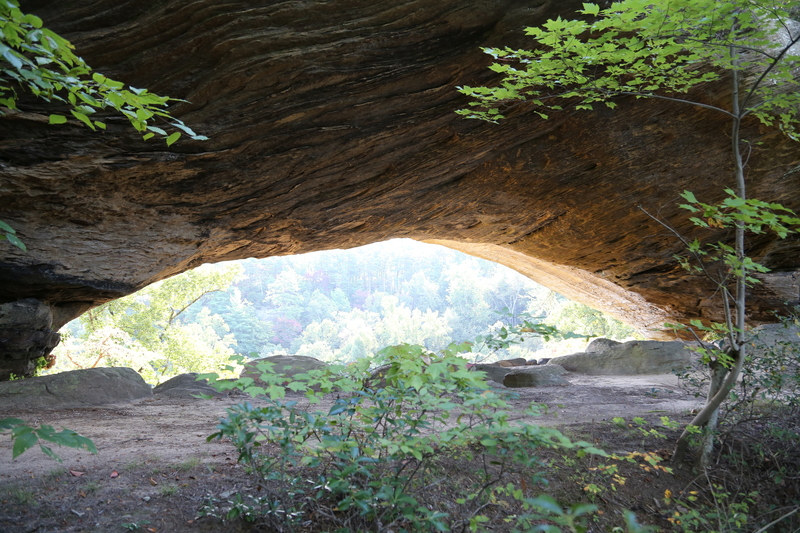 If you only take one trip to Red River Gorge, I would suggest camping off of the unofficial Star Gap Arch trail where you will have several good options allowing for backup if one is filled. Also, the spots on this trail are not too far from the trailhead. If you use this as a base camp, then you can do some day hiking. In particular the Auxier Ridge, Auxier Branch, Double Arch hike I describe is one of the best and is the one I would recommend if it is the only one you do in the gorge. Awesome pictures! I did those trails this past fall. I camped along jailhouse rock trail, close to the first lookout, watched the sunset there then woke up early to hike and watch the sunrise on jailhouse rock. Happy Trailing! Thanks! We love it there and get there as often as possible, even if we can only go down for a day hike. Happy trailing to you, as well! Thank you for the tips. We would like to visit there but have not had a chance yet. Hopefully next year. You’re welcome. It is an amazing place! We get down there as often as we can. I’m hoping to get down there for a winter backpacking trip this winter. wow very nice. We are into backcountry stuff too. I will enjoy fillowing your adventure. Thanks for following. It looks like you have had some great adventures, as well. I look forward to reading more. Thank you. We had a plan to visit red river gorge this fall but we ran out of time… Our RV is now in NY and need to go back to CA before hitting snow. Means I have time to study more about red river gorge by reading you blog!